Friends, let’s talk about squid ink. Ever since the early days of Measure and Stir, I have wanted to try to make a squid ink cocktail. It’s rare to be able to make a drink which is so jet black, blacker than blackstrap rum, blacker than coffee, blacker even than kurogoma. I don’t normally select drink ingredients based upon their color, but in this instance I was hoping to capitalize on the briny, oceany flavor of the squid ink. I had never tasted squid ink on its own, and it turns out that while it smells very fishy, it tastes primarily of salt, and only subtly of that. The amount of squid ink needed to color a drink is much smaller than the amount needed to flavor it. A pinch of salt would work about as well. Integrating the squid ink into the drink was a small challenge. It is very solid, and although it can be dispersed, it will not do so willingly. A vigorous thrashing with my barspoon is not enough to break it up; I had to use my immersion blender, which I also use for making egg white foams. For the base of this drink, I selected a rum sidecar, hoping for synergy between its citrus and any oceany flavors which might manifest. Moreover, I used Kraken rum as my base, both for its thematic content and because I have greatly enjoyed rum sidecars made with kraken in the past. Combine all ingredients mixing tin and integrate using an immersion blender. 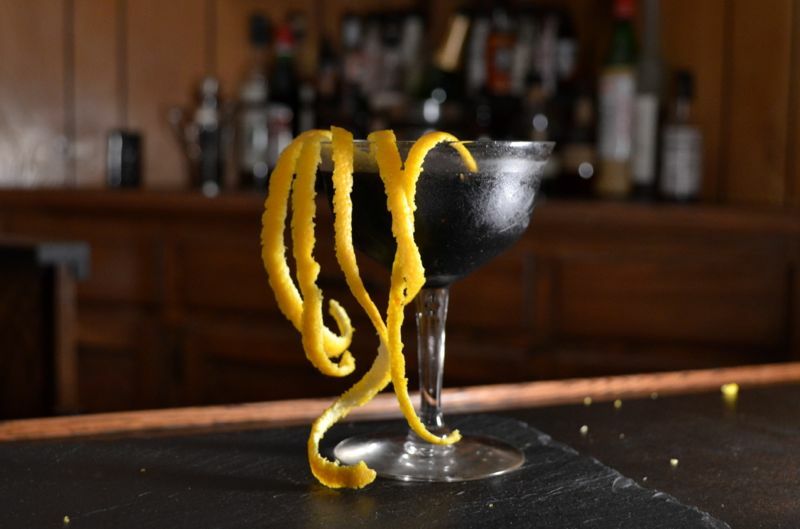 Once the squid ink is dispersed, shake over ice and strain into a cocktail glass. Garnish with many tentacular strips of orange rind, and a dash of evil. I’ll flatter myself and say that the briney flavor of the squid ink created an intriguing impression of fresh seafood that blended harmoniously with the flavors of citrus and spiced rum. To be honest, I wasn’t totally sold on the spices, but they did add something that would have been missing with an unspiced rum. I have a bit of a one-track mind when it comes to these things, but an unspiced rum and a dash of mezcal might have been an improvement. I won’t say this was an immensely delicious drink, but I could see it as an acquired taste, and I enjoyed the novelty of the flavor, if nothing else. I tried making a second squid ink cocktail, but it looked exactly the same, sans theatrical garnish. Thereupon I grew tired of such monotonous aesthetics, and made drinks of other colors. My recommendation is that you only make one squid ink cocktail per session. Categories: modern drinks, original creations | Tags: alcohol, bartending, booze, cocktail, cocktails, cointreau, craft cocktails, cthulhu, drinking, drinks, Kraken, liqueur, lovecraft, mixed drinks, mixology, r'lyeh, rum, sidecar, spirits | Permalink. I love it! I can’t believe I still haven’t done a lovecraftian cocktail. Ditto. It’s great look. But perhaps an absinthe based Lovecraft cocktail would be in order to play up the insanity side. BTW, I recently found you blog and I’m enjoying your post and journey into cocktails. Keep up the great finds.